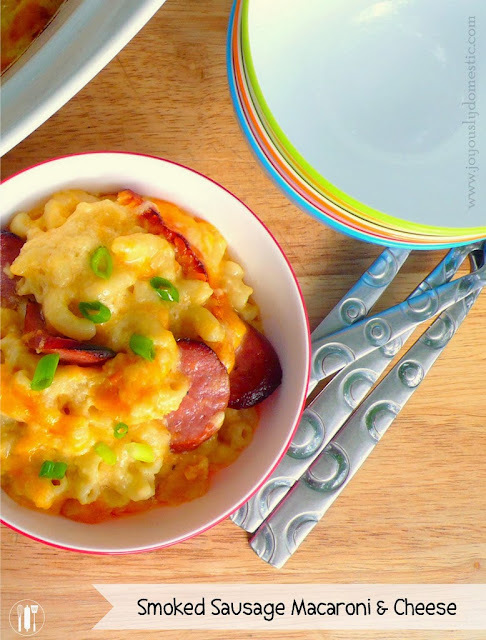 The addition of smoked sausage to homemade "mac-n-cheese" is a welcome and delicious change from the traditional basic recipe. It's hearty enough to serve as a main dish ... with a salad or some roasted veggies maybe. And, as you'll see below in the recipe directions, my "placement" of the sausage yields crisp, browned edges to the sausage that adds another dimension of flavor to this dish. And, nope, this definitely isn't "diet food," folks. This is a recipe that I make on occasion when my family is craving something comforting and cheesy. Homemade macaroni and cheese can't be beat and is truly a worth-while dish to make on a day that you just wanna indulge a little. 6 - 8 ounces smoked sausage, sliced into "coins"
In large pot, boil the pasta in heavily salted water until just shy of al dente. Drain. While the noodles are cooking, melt the butter in a large sauté pan set to medium heat. Sprinkle in flour. Whisk to combine, then allow a few minutes for raw taste of flour to cook out while whisking occasionally. Next, whisk in the milk. Bring to a simmer - but do not allow to boil - while continuing to whisk until smooth. Add in the nutmeg to taste. Mix in the salt and pepper. Turn off heat. Whisk in the sour cream. It will be lumpy and look curdled during this time of the cooking process, but will eventually incorporate into the sauce. Whisk in the grated Parmesan cheese. Add in the cheddar cheeses (8 ounces of sharp and 6 ounces of mild) - adding just a handful at a time while whisking to ensure even melting - until sauce is creamy and thick. Add the cooked pasta into the sauce and combine. If the pan isn't big enough, do this in a large mixing bowl. Pour mixture into a 9x 13 or similar size baking dish that has been greased with non-stick spray. Top with the 2 remaining ounces of mild cheddar cheese. Cover the whole dish with aluminum foil and bake for about one hour or until browning is just beginning on edges and top. Increase oven temperature to 375 degrees. Uncover and continue to bake for about 10 extra minutes or until cheese is all G.B.D. (golden, brown and delicious) on top. Remove from oven and allow to sit for 5 minutes before digging in! Garnish with fresh parsley or green onions, if desired.